Two years ago I acquired a large number of used Pola buildings in various states of collapse. For the most part it was several boxes of parts. Sold as 1/22.5 scale the buildings are much closer to 1/20.3. All that is required is to raise the top of the door frames by 1/4″ and you’re in business. Many of the buildings I have created from these parts can be viewed on the main structures page. Most of the Pola line is based on European styles, but they did offer an extensive line of American western style wood buildings. Typical of the mid to late 1800s they all feature four pane double hung windows. To update these to the early 1920s and beyond I decided to recast single pane windows that would fit the original openings. 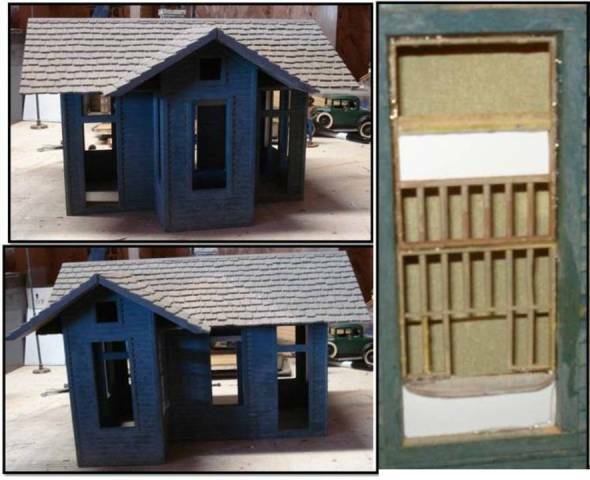 These windows are usable across the entire series so I started with the small depot building. It will become the Mining Office at the upper loop’s yard. I began by sliding the vestibule over to the far left side. This covered the second door and created a space that suggested a paymasters window. I built a barred window out of left over pieces from the bank kit for use on pay days. Using a wall section from another kit as a guide I cut styrene pieces and fitted them in to create a master for the new single pane window. This insured a good fit and created a lip on the inside that would help hold it in place. Once the master was cured I glued it to a piece of old veneer counter top and built a low dam around it about 1/2″ high. Using RTV from Allumalite (High Strength 3) I covered the master and let the silicone cure for several days. When it was ready I peeled the mold off the master and poured it full of two part epoxy resin also from Allumilite. I used quick-set resin with only 90 seconds of open time. This is what had come with my basic kit from Hobby Lobby. Looking at Allumalite’s webpage they have versions in 3 and 8 minute open times I will use in the future as 90 seconds really rushes the process making it unpleasant. Before it gave out I was able to make 80 windows from this single mold. Once the windows were done I cleaned up the flash and inserted them into the building using E3K. 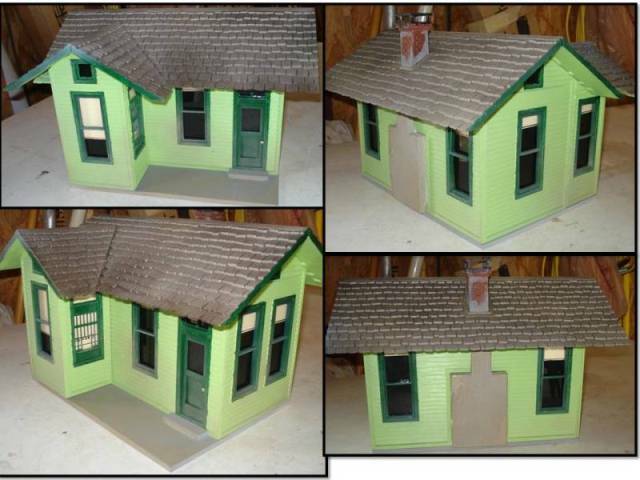 I had already painted the building with its base color of Apple Green (Krylon). 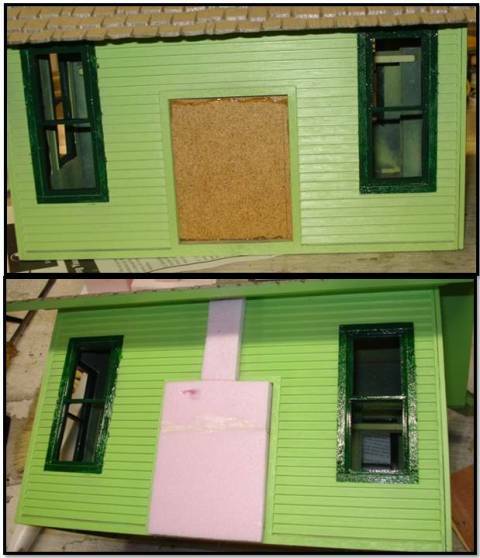 The front door was made from styrene and glued in at the same time. What had been a very low freight door in the rear was closed off with a piece of hardboard and a fireplace shaped insert made from construction foam. The fireplace was covered with tile grout and painted gray. 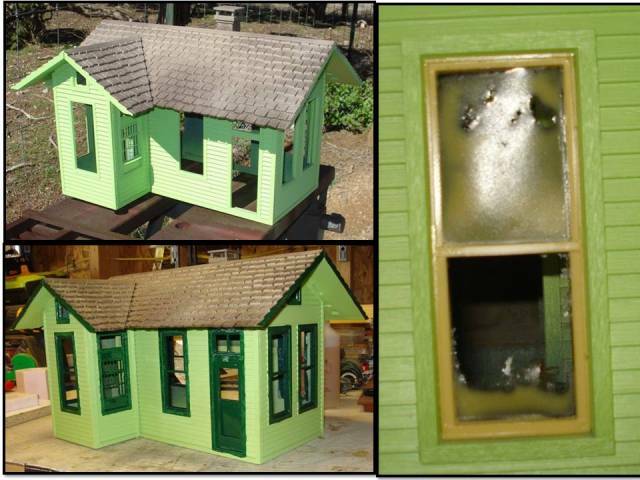 The trim and window frames were painted forest green using Rustoleum oil based paint. Window glazing was cut from 1/16 thick plexiglass. 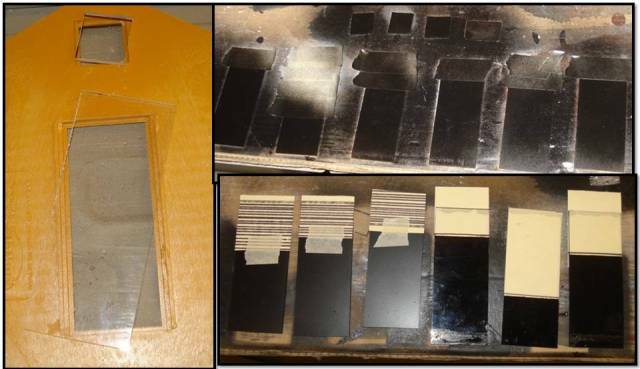 It was blocked off at different heights using tape and scrap card-stock to leave different amounts of clear space. These spaces then had pieces of card-stock with horizontal lines, glued in from the inside to represent blinds and draw shades. The glazing was then glued in behind the window frames using clear silicon sealer. The rest of the details were painted and the office was attached to a painted plexiglass base using screws in case future removal is needed. You can see from the picture what I mean by the scale of the buildings. 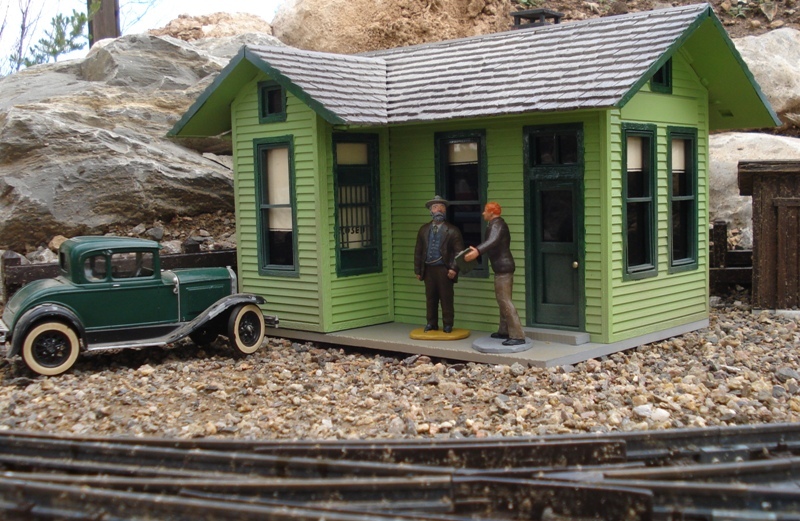 The figures are 1/20.3 while the car is a 1/20 scale Hubley kit. Below: Red McEntire shows George Breece where the road off the Mining Company’s property is.